What does Seafile do for you? Basically, it allows you to create a storage space for a particular user and he will be able to access and/or share it wherever and whenever he wants. 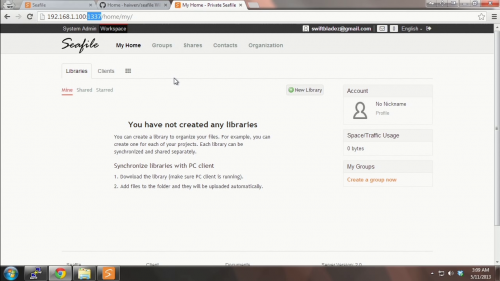 Files will be synchronized across devices. It is great for file collaboration or simply for you to store files to transfer between devices and for easy access. Yes it is exactly like Dropbox, Box.net and your other cloud storage services. You must be wondering why use Seafile instead of other free services that are readily available out there? For a start, you get to choose the amount of space you want to have as long as you have the drives to support it. Secondly, it is a great way to uphold privacy of your files as ultimately the files stay with you. Thirdly, it is something that you can do with your NAS so why not. There are reasons why I chose Seafile and one of which is that it is completely free. ownCloud, the other main popular competitor, is great but the mobile apps that they provide do cost a small fee. There are many people discussing the pros and cons between the softwares and you can simply Google them up. What I’ll say is that both are great but if you want it to be absolutely free, Seafile is the way to go. That said, Seafile is extremely easy to setup. You can follow their official instructions or watch my video/read my paraphrased guide to get everything up and running. You will arrive at the login page. Simply use the username and password you’ve keyed in earlier to log in to the admin account. You can now manage from there (create new users etc). Once you have everything done and confirmed to work (locally). You can start port forwarding the relevant ports to give global access. Please remember to create rules for the ports within your firewall should you run one (you should). You can follow these instructions to ensure that Seafile is part of your NAS start up process (in event your NAS is restarted). Otherwise have fun with it! Try it out on your smartphones, your mac, pc etc. If you would like to customize the software further, do read the official wiki for more information.